A brief period of rain will impact New Jersey late Friday, before heavy rain and gusty winds pick up Sunday into Monday. Clouds have returned to the skies of New Jersey. Our next storm system will push through the state (from SW to NE) between Friday midday and Friday evening. We'll see some rain - overall, the period of wet weather will be brief and not a big deal - but the heaviest rainfall is likely to coincide with your ride home from work/school. Bring an umbrella, make gratuitous use of your windshield wipers, and slow down a bit. Temperatures will climb from the chilly 30s Friday morning into the mid 40s later. That's still above normal for mid-to-late January. And temperatures will remain above freezing for the duration of Friday's storm system too. Our biggest weather concern in the coming days will be a coastal storm system that is expected to slide up the coast and impact New Jersey starting on Sunday. This is a nor'easter - a term that relates to a powerful coastal storm that produces "nor'east" (northeasterly) winds. Often times, nor'easters produce big snow here in the Garden State during the wintertime. However, our continuing streak of warm temperatures is key to this forecast: rain will be the big problem, along with strong winds and the threat for coastal flooding. With only 48 hours to go before storm onset, forecast models are still wishy-washy about timing. The NAM model puts first raindrops over New Jersey Sunday morning, the Euro starts up around midday, and the GFS holds off the rain until Sunday afternoon. The bottom line is that our weather will quickly go downhill at some point on Sunday. Models are in relatively good agreement regarding the spread and intensity of rain. 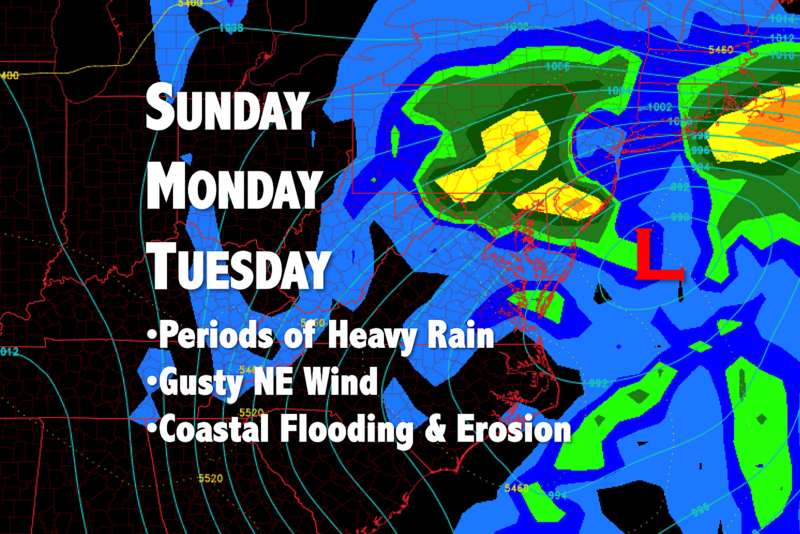 Periods of heavy, steady rain will move through the Garden State from late Sunday through Monday, and possibly into Tuesday morning too. It's not going to rain for that entire 3-day stretch - there will be breaks and lulls along the way. This system will certainly enact soaking rain - between 1 and 3.5 inches statewide. Great for our drought situation. Not great if flooding occurs. The vast majority of New Jersey should escape subfreezing temperatures and wintry precipitation. However, there is a good chance that some cooler air will leak into NW NJ Sunday night and again Monday night - potentially cold enough to produce some freezing rain and even some snow. This scenario would be limited to the state's cold zone, the higher elevation area approximately north of I-78 and west of I-287. Even then, we're not talking about big accumulations. The ground will be slippery for a time. But only until temperatures warm and rain resumes, causing any snow/ice to melt quickly. Meanwhile, a strong northeast wind will pick up late Sunday and especially Monday. Winds may gust to 50 mph along the coast, with 40 mph gusts possible across inland New Jersey. That's enough to potentially cause sporadic power outages and make driving difficult (especially high-profile vehicles like trucks and buses). 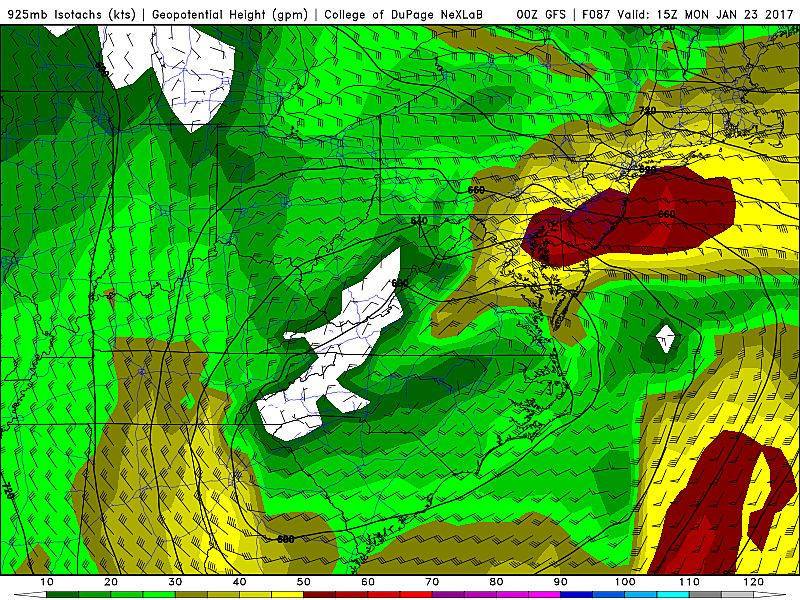 Furthermore, that fierce wind blowing over the ocean will likely push some water toward the Jersey Shore. That puts the threat of coastal flooding and beach erosion on the table. I'm not quite ready to talk about the magnitude of these potential coastal impacts (minor, moderate, major, etc. ), nor where on the coastline this flooding might be worst. For now, I'll just remark that if you live along the coast or a tidal waterway, you'll want to pay careful attention to the latest forecast and any warnings/advisories that are issued through the weekend. As always, our weather, news, and traffic departments will stay on top of this impending storm throughout the weekend. Next weather blog update is expected by mid-morning Saturday.